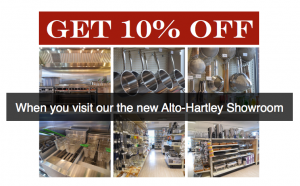 Whether you’re a commercial foodservice operator or a home chef in Washington, D.C., Maryland or Virginia, we want you to take 10% off your next visit to the Alto-Hartley showroom. When you visit our showroom, you can buy more than 2,500 items. Come visit us today, and get 10% off your visit! Download your coupon, and visit the Alto-Hartley showroom in Alexandria, Virginia.